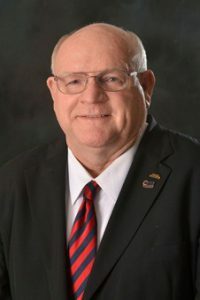 G. David Gillock has served as mayor of North Ridgeville since 2003. “The city has always had a great relationship with the college,” Gillock said. The campus provides vocational training in various areas, such as computer science, engineering, and emergency medical services. “[Ridge campus] trains people that live in the community to eventually work in the community,” Gillock said. Civic duty and community involvement have always been a part of Gillock’s life, he said during a meeting with Lorain County Community College students on April 6. While speaking with students, Gillock touched on many topics regarding the city of North Ridgeville, including upcoming projects. The $60 million road project to widen Center Ridge Road, a $13 million proposal to widen Lear Nagel Road, and the construction of a roundabout at the intersection of Route 83 and Mills Road are all part of the mayor’s future plans. Securing these funds is a challenge, Gillock admits, but the city has access to additional non-tax funds through grants and federal funding. Bringing in business is another achievement the mayor is quite proud of. Riddell, a company that manufactures helmets and other sporting equipment just finished construction on a new factory on Center Ridge Road. A new University Hospital building is currently under construction on Lorain Road, which Gillock believes has potential to turn the area into a community of medical centers. Both businesses will provide the city with economic growth and the possibility for many new jobs. Gillock grew up in a small town in Illinois and was raised by his father, who was active in the community. “I have always been civic-minded,” Gillock said. Gillock’s time in Northeast Ohio began long before his time as mayor. He and his wife moved to the area in 1978 when Gillock was transferred as an employee of Aetna Insurance. Following his time at Aetna, and after two failed attempts of running as a Republican for Ward Councilmen in North Ridgeville, Gillock won on the third attempt when he ran as an at-large candidate. He has been consistently re-elected as mayor since his initial victory in 2003. “I think name recognition and accessibility are important,” Gillock said about his recurring re-election. “I’m on duty 24/7. It takes an hour to pick up a gallon of milk at the store,” he said, jokingly.